Why are Big Data and Analytics such a game changer for HR? As outlined in this blog by our colleagues Iain Hubert and Nigel Lewis, there are a number of reasons why big data and analytics are vital to the to the future of HR functions. 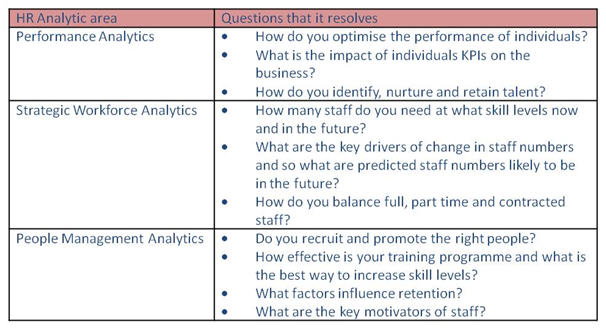 To understand how the application of data processing and analytical techniques to the data, we classify HR analytics in three key areas – see figure 1 below. What is driving the need to embrace HR analytics now? The questions above are not new, so what makes now the right moment the HR organisation to become more data driven? We believe the answer is in the rise of the Big Data technologies and the associated abundance of data and methodologies. Indeed, this is clearly evident with the profusion of HR data easily accessed both internally in organisations, e.g. ERP systems or enterprise data warehouses, and externally, e.g. online CV repositories, social media etc. Moreover, Big Data technologies are presenting the opportunity to store, analyze and take decisions with higher speeds and lower costs than ever before. For example, Capgemini has designed solutions that in real time match internal or external CVs with available job postings: using algorithms based on natural language processing, these solutions are able to measure the distance of the keywords between the job description and the CVs – matching the best candidates. Trials have shown a precision that can match or surpass human ‘eyeballing’. And it is worth noting that a variety of data sources can be used e.g. geographical data – to consider the distance between the candidate’s home location and the office, and weather data – for seasonal jobs. Another example consists of using internal data about someone’s work profile, achievements and results (sales, costs etc) to identify what makes a high performing employee, identifying common traits relevant to specific job positions, which in turn helps in the early identification of high potential talent. What are the challenges to adopting HR analytics? Technological enablement alone, although necessary to provide fast and robust solutions, is not enough. Not least, we need to consider the cultural implications of a pervasive data driven HR. HR is about people; nobody likes to be treated as a number. Particular attention must be given to obtain the necessary buy-in from all users involved in HR analytics programs. Being open and showing that they benefit the employees as much as their companies, for example giving the appropriate access to the initiative results to all the employees, will be a key part of the success of all HR analytics. If you would like to know more, contact: Sébastien Guibert, Big Data Solutions & Programs Director for Capgemini France or Andrea Capodicasa, Senior Solution Architect, Capgemini UK Insights and Data.